The economics of clothing involve three processes: production, making the clothing; distribution, getting the clothing from the maker to the consumer; and consumption, actually using the clothing. Although consumption drives production and distribution, the three processes are in many ways inseparable. The system is fiercely competitive at all stages, partly but not entirely because clothing is a fashion good. Although some plain utilitarian garments may seem to be little affected by fashion, their production and distribution are highly competitive as well. In developed nations, fashions in clothing and other goods and services change so rapidly and in so many ways that it's difficult to keep track. People may assume that, in ancient cultures or isolated societies, styles of clothing, dwellings, tools, and customs remained static for generations. Yet scholars discern small incremental changes when they can find sufficient data. Major features of the economics of clothing today have roots in the distant past. Perhaps in prehistoric times, or on the frontier of pioneer America, isolated family units produced all their own clothing. But in fact, most people probably hunted in groups for large, fur-bearing animals and specialized in doing certain tasks. Production of apparel has always been highly labor-intensive, and evidence of specialization appears early. Twenty thousand to twenty-six thousand years ago, in the north of what is now Russia, a young man was buried in a shirt and trousers elaborately embroidered with ivory beads. At roughly the same time, in what is now France, craftsmen were carving delicate sewing needles from bone. To shape and drill beads or make needles with the materials and tools available then would require both inherent manual skill and considerable practice. Probably only one person in a settlement or a cluster of settlements mastered the skills for such work; others did tasks such as harvesting and processing fibers or skins and assembling garments. Presumably these specialists bartered what they made for goods and services of other group members. Specialization optimizes use of individuals' time and abilities and makes better quality clothing possible for all. Scientists who uncovered the grave of the youth in the beaded outfit concluded that he was a person of importance-he or his family possessed wealth or power to command a costume of such splendor. Clothing already expressed status, more than 200 centuries ago. The apparel economy is truly global. From earliest times, it has extended to the limits of human occupation. In each geographic area, people exploited native plants, animals, and minerals. The Chinese learned the secrets of the silkworm; linen grew in the Nile valley, cotton in the Indus River valley; Mesopotamians raised sheep for their wool. Shellfish found at the eastern end of the Mediterranean sea provided precious purple dye. Polar cultures relied upon the furs and skins of local creatures, both land and sea. Natives of what is now the Pacific coast of Canada used cedar bark garments to shed rain; some peoples made cloaks of grasses. In time, precious textiles, furs, and ornaments moved by long, difficult overland trade routes or hazardous water voyages. Later, textile centers evolved where people demanded large quantities of luxury fabrics and were willing to pay well for them. Byzantium, as well as Sicily, produced fine silks during the Middle Ages, although they were far from the original sources of silk. Even so, proximity of raw materials gave some geographic areas advantages over others. Certain districts in Italy, Germany, Flanders, and England became textile centers, specializing in locally produced fibers and distinctive techniques. In medieval times, traveling merchants transported fine textiles from production centers to regional trade fairs on a regular basis. The ramifications of trade in textiles and other apparel materials extended far beyond the obvious. In ancient Mesopotamia, the need to record exchanges of these and other goods stimulated development of counting systems and writing. 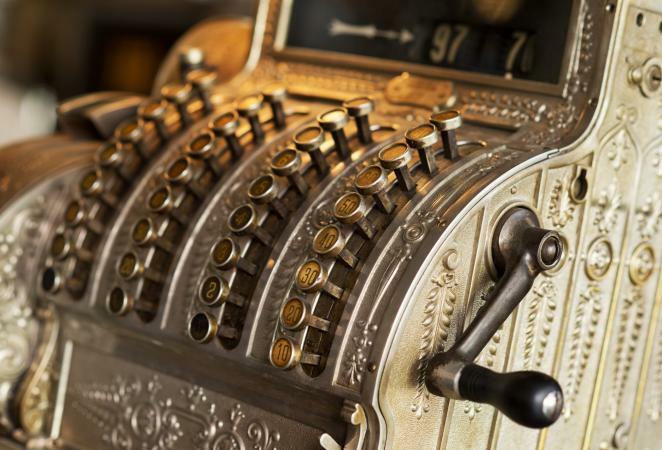 Eventually, coinage evolved to expedite transactions. Still later, Italians pioneered bookkeeping, banking, and legal systems to facilitate and organize international commerce. The great plague, the Black Death, which killed as many as one-third of the people in Europe, may have reached Europe from Asia in the middle 1300s, transported by infected fleas on furs carried by caravans along the ancient silk road. As the plague abated, fashion change accelerated because of greater concentration of population in cities, shifts in the distribution of wealth, and growing importance of commercial life. The demand for furs in the sixteenth century, including beaver skins to make fine felt hats, became a major force driving the exploration of North America. Remote Australia and New Zealand were settled largely because sheep could be raised profitably there. In the Middle Ages and Renaissance, members of guilds produced elegant and costly clothing to order for wealthy and high-ranking people on the European continent. Guilds were part civic associations, part trade associations, part labor unions. Guilds specialized in certain crafts ranging from hats to shoes. Membership was strictly controlled; new members served long apprenticeships and had to meet strict criteria for admission. Detailed rules served to uphold quality of production and limit competition. In general, men dominated the guilds; women did certain specialized tasks such as embroidery but had little role in governance. Not until the late 1600s, as guilds were ebbing in power, was the first guild controlled by women, the mantua makers, officially recognized in France. Nations have long promoted fashions to stimulate demand for their products. In the 1600s, King Louis XIV displayed the beauty of French silks and laces by wearing them and dictating that members of the French nobility also showcase French products. France sent dolls dressed in the latest fashions to other nations to create desire for French goods among the upper classes. According to Mr. Pepys' diary, Charles II of England introduced a subdued style of men's clothing in England in 1666, partly to promote English wool and linen fabrics. "Fashion" is a complex concept, but economic analyses require simple, operational definitions. Therefore this essay uses definitions based on those stated by Paul Nystrom in his 1928 book, Economics of Fashion. He defined "style" as "a characteristic or distinctive mode or method of expression in the field of some art" (p. 3) and "fashion" as "the prevailing style at any given time" (p. 4). A source of confusion is that the word "fashion" can be used to mean either "content" or "process." In writing or speech, the word "fashion" is often misused as a synonym for women's clothing. Yet most consumer goods and services are subject to the fashion process. Fashion also affects noneconomic matters such as social customs. The economic structure of consumer goods industries reflects the role of fashion, which in turn indirectly affects basic industries. Because "fashion" can involve virtually all aspects of contemporary life, this essay concentrates on the economics of clothing. "Demand" is not a quantity; it is the relationship between prices and how much consumers are willing to buy at various prices. If demand for a commodity is great, people will generally buy larger amounts of it at various prices than they will buy if demand is small. During the reign of Charles II, according to Beverly Lemire, the ready-to-wear clothing industry originated when shipowners or the British navy ordered plain, coarse garments in quantity to outfit crews of English ships heading to sea on voyages lasting months or years. There were as yet no garment or textile factories in the modern sense. Garment production was controlled by (mostly) men who contracted with the government or shipping companies, bought materials in quantity and then hired workers who took the supplies home with them to make the garments by hand. Workers were paid by the unit, and the contractors often cheated them. The system of subcontracting clothing production continues today. Although production of ready-to-wear clothing began before sewing machines existed, an English clergyman had invented a hand-operated knitting frame near the end of the sixteenth century. Queen Elizabeth I refused to grant him a patent because she feared it would put English hand-knitters, using knitting needles and mostly working at home for contractors, out of work. But by the eighteenth century, England led the industrial revolution with a stream of inventions that eventually reduced prices of many goods and improved their quality so that ordinary people could afford them. 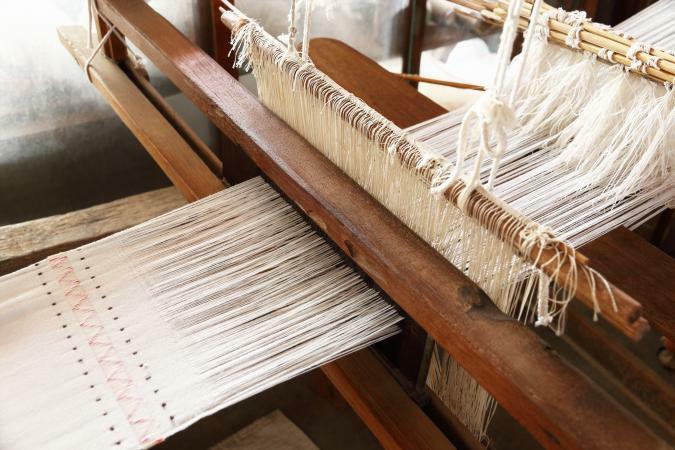 By the later 1700s, English factories were turning out fabric on water- or steam-powered spinning and weaving equipment. Demand for inexpensive clothing gradually increased in England as lower-class people, some of them employed in the new factories, began to have a bit more money to spend, as well as a growing interest in fashionable clothing. London stores began to display appealing merchandise in lighted shop windows and encouraged shopping as recreation. Even low-income people could buy small ribbon ornaments and other accessories (See McKendrick, Brewer, and Plumb). Meanwhile, clothing styles of English noblemen became simpler and more functional as they supervised agricultural activities on their estates rather than hanging around the royal court, as was the case in France. French noblemen copied English styles when the French Revolution made it dangerous to be seen in public wearing silks and laces. By the early nineteenth century, workingmen's clothing was being cut and hand-sewn by workers who specialized in specific tasks rather than each making a garment from start to finish. In American coastal cities, workers constructed garments for sailors in lofts where sails were made, from the same sturdy materials. Inventors designed the first sewing machines, but handworkers, who feared losing their jobs, broke up the machines, which didn't work very well anyway. Improved versions soon followed; the 1800s brought numerous apparel-related inventions and discoveries, including shoemaking machinery, vulcanized rubber, artificial cellulosic fibers, and synthetic coal-tar dyes. Wars such as the American Civil War created demand for large quantities of uniforms. Based on measurements of servicemen, standardized sizing of men's clothing evolved. By the later 1800s, men's factory-made clothing of reasonably good quality and fit was being produced in quantity. Although wealthy men still wore custom-made clothing, moderate-income men could dress better than ever before. The situation for women's clothing differed from that for men's clothing. Styles were relatively simple in the later 1700s and early 1800s, but then outfits became increasingly ornate and complex and remained so for the rest of the nineteenth century. This complexity, plus lack of measurement data for women, delayed large-scale factory production of women's clothing. Late in the century, when separates-shirtwaist and skirt styles and tailored women's suits-became fashionable, it was easier for women to find ready-made clothing to fit. By the end of the 1800s, output of women's factory-made clothing was growing rapidly. Although wealthy people still wore custom-made clothing in the 1800s, the guilds were gone by the time Charles Worth, ironically an English immigrant to Paris, opened the first couture house in the mid-nineteenth century. The Paris couture, offering exclusive new styles for women to be made-to-order each season, reached its peak volume in the late 1800s and early 1900s. Only the richest women could afford couture apparel, and volume was never large, but the couturiers were masters of publicity. Actually, the practice of holding well-publicized "showings" of new fashions each season originated in England not with clothing designers but with such enterprising businessmen as Josiah Wedgwood, who in the late eighteenth century invited well-to-do customers to seasonal openings of his latest designs in tableware and decorative ceramics (See McKendrick, Brewer, and Plumb). With the help of fashion magazines, which originated in the early 1800s, and paper dress patterns for home sewers, introduced later in the century, seamstresses copied or adapted couture designs for middle-class clientele far from fashion centers. In America, some dressmakers traveled from household to household twice a year, spending a couple of weeks making new clothes for all females in a family. Electric-powered sewing machines were installed in factories, but home sewers and dressmakers used machines with foot treadles so they were not dependent on electricity. The first department stores opened in major cities in the United States and Europe in the mid-1800s, with clothing as a major category of merchandise. Instead of bargaining with customers over selling prices, as small shopkeepers did, department stores began putting price tags on their goods. Retail magnates such as B. Altman, John Wanamaker, and Marshall Field built palatial stores to dramatize shopping as recreation. Streetcar transportation, first horse-drawn and later electric-powered, brought customers downtown. Smaller stores specializing in men's or women's apparel, children's clothing, undergarments and lingerie, or shoes, profited from customer traffic attracted to city centers by big stores. Catalog order firms such as Sears, Roebuck originated in the 1800s as postal service and railroads developed in the United States. Mail order made ready-to-wear clothing available to rural and small-town residents. The first outlying shopping centers opened in the second and third decades of the twentieth century, as automobiles multiplied; Sears, Roebuck opened its first retail store in an early shopping center. After World War II, building of suburban branches of large department stores and major regional shopping centers accelerated, leading to the decline of downtown shopping and the closing of many central city stores. Giant regional shopping centers capitalized on the entertainment aspect of shopping and consumers' seemingly limitless appetite for variety. Accelerating competitive trends in the apparel business has been the gradual decline of clothing's share of total consumer spending. What limited records survive show that during the Middle Ages and Renaissance in Europe, in the heyday of the guilds, rich people spent huge proportions of their incomes on luxurious clothing for themselves. Furthermore, the nobility outfitted the various ranks in their households, even down to the lowest servant, in appropriate styles and the manor's heraldic colors for specific festivals or occasions. Once, there were only limited ways to spend money to demonstrate one's wealth-what Thorstein Veblen named "conspicuous consumption." In the past 150 years, factory production has made clothing for ordinary people less expensive, while many appealing new products have become available: phonographs and parlor pianos, household appliances-including sewing machines- motor vehicles, and electronic goods, starting with telephones and radios. All of these impressed people's friends and rivals, competing with clothing for the consumer's money. 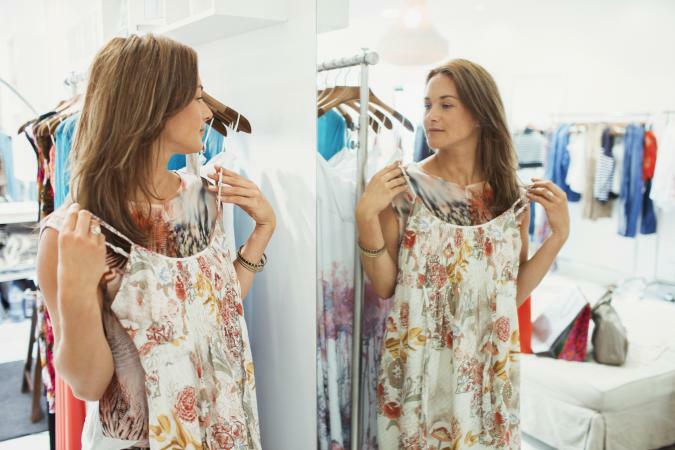 Of every twenty dollars Americans now spend, only about one goes for clothing. Simultaneously, long-term fashion trends, dating back at least to Charles II of England in the 1600s, have moved toward ever-simpler, less-formal, more casual clothing even for people in the upper ranks of society. As more women work outside the home, fewer of them dress to showcase their husbands' wealth and prosperity, as they might have in Veblen's world. Demand for men's tailored clothing declined in the later twentieth century, as did the number of specialty stores selling men's clothing, as men chose more casual clothing and active sportswear. Couture was not profitable after World War I; its client base dwindled further during the Depression of the 1930s. Designers tried to control copying of their designs and sometimes produced lower-priced replicas of their own exclusive models. Design piracy has long been a plague for clothing manufacturers and designers, but no tactics seem to stop it, especially when consumers are eager for the latest fashions at the lowest possible prices. The spending of fickle teenaged customers, anxious to look like popular entertainers, accelerates the pace of fashion change. For a time after World War II, couture houses licensed their names to other firms to produce lower-priced clothing merchandise and accessories. Some ventured into men's wear, with limited success. In Europe and North America, the number of establishments producing fine custom-made clothing and the number of customers that bought it had declined. Demand continues to shrink for complex and costly custom-made apparel such as elaborately embroidered or beaded garments. To the extent that such clothing is still produced, production moves to India and other Asian countries. By the late twentieth century, large European corporations, some outside the apparel business, competed to buy Paris couture houses and leading Italian design firms, while other high-end design houses gobbled up each other. Sales of expensive apparel and luxury accessories to wealthy people and entertainers all over the world burgeoned in the 1990s' economic boom. Designer-name firms outdid each other by opening showy retail stores, designed by avant-garde architects, in major cities around the world, but some of these stores attracted more lookers than purchasers and soon closed. Young design-school graduates from England, Belgium, New York, California, and elsewhere started their own small firms; only a lucky few achieved enough recognition or financial backing to stay in business. Clothing workers have always been poorly paid. Clothing for serfs and servants on medieval estates was produced on-site, usually from materials grown, harvested, and processed by serfs-essentially, slave labor. Slaves made their own clothing on American cotton plantations. Clothing production prospers where cheap labor is plentiful. Although some operations require great skill, most construction tasks are divided into small steps that can be learned quickly. In the past 200 years, garment factories have been among the first large-scale manufacturing enterprises to open in developing nations. In nineteenth-century New York, manufacturers crowded hundreds of poorly paid immigrants into high-rise buildings, often in unsafe situations. Contracting and homework were widespread. One group of immigrants after another supplied the labor-German, Irish, Jewish, Italian; in the twentieth century, Puerto Ricans, Chinese, and Blacks joined the list. Even today, "sweatshops" owned by and employing immigrants from Asia flourish in New York City. During the second half of the twentieth century, garment manufacture spread to Hong Kong, then to China and other parts of southeast Asia, not to mention Latin America and African locations that have large numbers of people willing to work for low wages. Although machines facilitate clothing construction, much of the process resists automation. Reading clothing labels is a lesson in geography. A longtime practice in the fashion industry is "factoring," whereby a company takes out short-term loans to buy fabrics and other materials to produce garments for the season, then repays the loans as retailers purchase the goods. The specialized lenders are called "factors." Factoring is not limited to apparel production; it also exists in other industries where fashion changes quickly, such as toys. A plague of the fashion business is that retailers squeeze manufacturers by returning unsold goods or paying less than the agreed-upon price. Because the garment business is so competitive, profits are low and existence is risky. 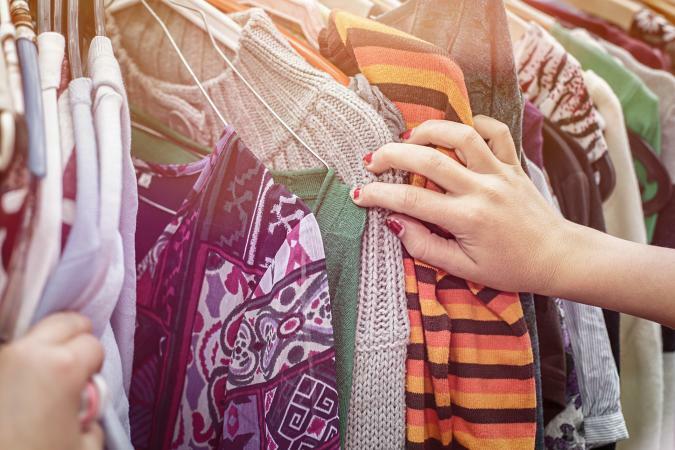 Trade in secondhand clothing has been important for many centuries. Once wealthy and high-ranking people gave their unwanted clothing to servants. Usually, servants sold the garments-they had no use for them and needed the money. Patrons of theatres such as Shakespeare's Globe donated clothing to actors who could not otherwise afford credible costumes when playing high-ranking characters. Used clothing, including stolen items, was sold by peddlers alongside crude, early ready-to-wear. In the nineteenth century, the first factory-made garments were sometimes introduced by secondhand clothing retailers. Stores selling both used and new clothing (including military surplus) existed until after World War II. Postwar, "yard" and "garage" sales became common, apparently inspired by such sales on military bases, especially when officers' families had to move to totally different climate zones. Consignment shops, operated by charitable organizations or private entrepreneurs, multiplied. As the quantity of discarded clothing in Europe and North America exceeded the capacity of welfare agencies to distribute it to the poor, large quantities of used clothing have been shipped to developing nations. In Africa, inexpensive used clothing can displace traditional apparel and compete with local industries. At the other extreme, "vintage" clothing-used couture or high-fashion women's clothing-has become so popular and acceptable that leading Hollywood actresses may wear old designer gowns to the Academy Awards ceremonies. Exclusive auction houses sell vintage designer clothing for high prices; retail stores in New York and Los Angeles specialize in such clothing. The garment business consists of all sizes of firms from giant to tiny. Although the trend is giant companies, these are not assured of success. Large corporations manufacture clothing under many labels. Some famous brand names produce different qualities of clothing for different types of retailers, contracting out production of some merchandise lines to other corporations. Major producers can go bankrupt unexpectedly; failure lurks just around the corner due to shifting customer tastes and a variety of other uncertainties. International trade regulations, tariffs, and quota systems engage the services of a corps of lawyers and other specialists. Everything changes quickly in the apparel world. Cities of developed nations are littered with abandoned factories, empty retail stores, defunct design houses, and wreckage of supporting industries. Once-famous department stores are now history; Montgomery Ward is nearly forgotten; Sears Roebuck slips in importance. Someday Wal-Mart may fade away. As more shopping centers and big-box stores open, downtowns and old shopping centers die. Everyone in the business knows that there is too much retail space, yet they keep building stores. Change is the only certainty. The next phase in clothing distribution may be the Web, whether goods are sold by conventional retail stores, catalog retailers, Web-based retailers, or something completely different. Auction sites such as eBay offer vintage clothing and also help manufacturers and retailers trade large quantities of materials and clothing among themselves. See also Department Store; Fashion Industry; Globalization; Labor Unions; Mantua; Ready-To-Wear; Retailing; Anthropology of Secondhand Clothes; History of Secondhand Clothes; Sewing Machine; Sweatshops. Benson, Susan Porter. Counter Cultures: Saleswomen, Managers, and Customers in American Department Stores, 1890-1940. Champaign: University of Illinois Press, 1988. Cobrin, Harry A. The Men's Clothing Industry: Colonial Through Modern Times. New York: Fairchild Publications, 1970.
Cooper, Grace Rogers. The Sewing Machine: Its Invention and Development, 2nd ed. Washington, D.C.: Smithsonian Press for the National Museum of History and Technology, 1976. Cray, Ed. Levi's. Boston: Houghton Mifflin, 1978. Danish, Max D. The World of David Dubinsky. Cleveland: The World Publishing Co., 1957. DeMarly, Diana. The History of Haute Couture, 1850-1950. New York: Holmes & Meier, 1980. Frick, Carole Collier. Dressing Renaissance Florence-Families, Fortunes, and Fine Clothing. Baltimore: Johns Hopkins University Press, 2002. Hansen, Karen Tranberg. Salula: The World of Secondhand Clothing and Zambia. Chicago: University of Chicago Press, 2000. Helfgott, Roy B. "Women's and Children's Apparel." In Made in New York: Case Studies in Metropolitan Manufacturing. Edited by Max Hall. Cambridge: Harvard University Press, 1959. Hendrickson, Robert. The Grand Emporiums. New York: Stein and Day, 1979. Lemire, Beverly. Dress, Culture and Commerce: The English Clothing Trade Before the Factory, 1660-1800. New York: St. Martin's Press, 1997. Lockwood, Lisa. "Mega-Merger Mania: The New Blueprints of Five Ravenous Firms." WWD 186, no. 36 (2003): 1, 6-7. McKendrick, Neil, John Brewer, and J. H. Plumb. The Birth of a Consumer Society: The Commercialization of Eighteenth- Century England. Bloomington: Indiana University Press, 1982. Nystrom, Paul H. Economics of Fashion. New York: The Ronald Press Company, 1928. Sandars, N. K. Prehistoric Art in Europe, 2nd ed. New York: Viking Penguin, 1985, pp. 49-50. Spufford, Peter. Power and Profit: The Merchant in Medieval Europe. New York: Thames & Hudson, Inc., 2003. Thorstein Veblen. The Theory of the Leisure Class. New York: Macmillan, 1899. Reprint, New York: The Modern Library, 1934. Walker, Richard. Savile Row: An Illustrated History. New York: Rizzoli International, 1989. Winakor, Geitel. "The Decline in Expenditures for Clothing Relative to Total Consumer Spending, 1929-1986." Home Economics Research Journal 17 (1989): 195-215.